The low-budget but ultraviolent Kichiku (Kichiku Dai Enkai) introduced filmmaker Kazuyoshi Kumakiri to an unsuspecting world in 1997. It was unflinchingly graphic and offended as many souls as it mesmerized on its extended run around the international festival circuit. Four years later, Kumakiri finally gives us his second film with Hole in the Sky (Sora no Ana). And it's a different exercise indeed. Or is it? The director himself explains the reasons behind a change-of-pace that wasn't such a big change after all. People have been saying that Hole in the Sky is very different from Kichiku. But I feel that maybe they're not so different, because they both deal with the behaviour of people in isolation. Maybe they became similar in a natural way, as far as the behaviour of the characters is concerned. Both Kichiku and this film are, in a way, reflections of myself. Hole in the Sky especially comes very much from within myself. In the beginning, when I started writing the screenplay, I envisioned the film as more light, heartwarming even. But time by time it became the type of film it is now, more serious, dealing with the behaviour and relationships between human beings. And especially about the character played by Susumu Terajima. That character is very different from Terajima's usual on-screen persona. His character in Hole in the Sky is a bit naïve and insecure. 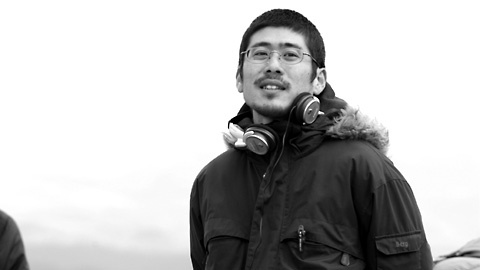 When I first started making films ten years ago, I had wanted to work with Terajima-san. Years ago I saw Sonatine, which I really liked. It shocked me in a way. In that film, Terajima-san plays a yakuza, but I had the impression that maybe this actor was more complicated. That he had a very masculine side but also a very fragile character. Several years later, at one of the first public screenings of Kichiku, Makoto Shinozaki visited and he introduced me to Terajima. The impression that I got from him that day was exactly like the impression I had received from seeing him in Sonatine, that he has both a fragile and a strong side. I wanted to show that other side in my film. He is a naïve person, in a good sense. I was wondering if you like the films of Alfred Hitchcock, because some elements from Hole in the Sky, like Terajima's character's attitude towards his mother, seemed very similar to themes in Vertigo and Psycho. (Laughs) I am aware of this. When I was writing the screenplay, I worried about its similarity to earlier films. But in American movies like Psycho these very isolated characters living in the countryside are usually psychopaths. The character in my film is isolated too, but he's not really outstanding in any way. I saw this character as just a miserable guy. But Terajima-san wanted to make him more of a man who was solitary by choice, as if it was a statement of coolness. So in the beginning we had some conflict about the difference of interpretation, but after discussing the character he understood my viewpoint and our working relationship became very smooth. In the film, the first time we see him he does have a sense of coolness about him. But that was my intention. Only the first time did I want him to look like that, to trick the audience into believing he was cool. But the scene later on in the film where he is on his knees in the street in front of the girl's ex-boyfriend is the complete opposite. It created an interesting contrast that I enjoyed putting in. The producer thought that scene of him on his knees made him too miserable, but I decided to keep it. But the subject of the mother complex completely comes from within myself. I have maza-kon too (laughs). The area where the film was shot was where I grew up and during my childhood my parents would take me to the woods to pick wild plants. In that kind of situation, in the countryside picking flowers, my mother would suddenly seem to me like a little girl. Very pure and happy and joyous. That memory of my mother ended up in the film. So, of course I like Hitchcock, but in the end the similarities are not intentional. I did not consciously try to refer to Hitchcock. During the writing I discovered there were similarities, but they happened naturally. I like Vertigo a lot, though. I also have a fear of heights, so I could identify with that character very well. Yuriko Kikuchi's character is very passive at times, especially in the scene where Terajima is fighting with her ex-boyfriend. She just stands back and watches. Is this a comment in a way on the role of women in Japan or is it just particular to the character? I don't think she is passive. I wanted to show the difference in her character towards the ex-boyfriend and Terajima. She still loves her ex-boyfriend and she is the type of person who prefers to love someone rather than being loved by someone. In that scene of the fight, she wanted to talk to her ex-boyfriend, but Terajima's character interrupts them, so she is bothered by him. She doesn't want to argue with him too, so she decides to just stand by the side. For Yuriko Kikuchi, Hole in the Sky is her first lead role. In Kichiku you worked with many non-professional actors. Do you enjoy working with inexperienced, non-professional actors and would you like to continue doing so? Kichiku was a student film, a graduation piece, so it was difficult to get professional actors. I chose the actors from my circle of friends, especially people with interesting faces or interesting personalities. But I would prefer to choose a non-professional to a professional who won't do a good job. I like to cast people who already have some kind of similar essence to the character I want them to play. I chose Kikuchi by way of an audition and with her too I had the feeling that she already had an essence of the character inside her. My way of directing was different from Kichiku to Hole in the Sky. With Kichiku everyone was a student, so they were difficult to direct and it was hard to get ideas and input from them. My way of directing on that film was very factual, I would simply tell them exactly what they needed to do. If I wanted them to look left, then I would instruct them to look left. Of course Terajima is a very mature actor, so he gave me a lot of input and ideas. Even Kikuchi, she was very enthusiastic about this project, so she also brought in ideas. It was a very interactive experience. There were four years between Kichiku and Hole in the Sky. Why did it take so long and what did you do in those four years? It took me a while to write the screenplay for this film. I had this idea for Terajima's character, but the story itself kept changing. Also I made a music video for a very unfamous band, who later split up. Additionally, it took a long time after finishing Kichiku before the film was released in the theatres and during that time I was writing another screenplay. But after I received a grant from the PIA film festival for Hole in the Sky it actually went very quickly. Especially the idea of having Terajima play this character who is the opposite of a cool guy. But writing the screenplay took a lot of time and we spent a lot of time trying to find additional funding for the film, because just the grant was not enough to be able to make it. In the end it took four years, but I would have liked it to have been shorter. You were born in 1974 and I find it strange for someone of your age to choose the 1970s student movement as the subject of their first film. Why did you choose something you can't have had any experience with? I don't think it's so unusual that my generation would be interested in this kind of subject. Our generation is very attracted to earlier generations because they had so much energy. Now we live in a peaceful world, so this energy and rebellious mind no longer exist. That makes it attractive. You've said in previous interviews that the subject of Kichiku, the increasing tension between people in a group, came from your own experience of working in groups as a student. It seemed to me that Kichiku was very much about the dangers of the forced hierarchy of the group. In university just before making Kichiku, I made a ten-minute short with a few other students. I directed it, because I noticed most of the others didn't think seriously about directing. To me it was very serious, so there was a clear difference in our states of mind. They didn't work very seriously and that annoyed me. So sometimes I felt like I wanted to kill the other students (laughs), especially when I was all alone doing the editing. So the premise of Kichiku really reflected this. Kichiku is in a way a very personal film to me. I liberated my own desires for violence and tried to open the inside of my mind to let out all the poison. And it's all there in the film. It made me feel ashamed of myself, like I was the worst person in the world to be able to think of those things. Was it hard to be so honest to yourself? I had a lot of anger inside me during the making of Kichiku. I had been with my girlfriend for one year at that point and just before starting the film, we broke up. So I was feeling very depressed and angry going in. Many of those emotions are in the film, so I could never watch it calmly. But when the film was screened at festivals later, I had to watch the film too and in that situation I was able to look at it with more composure. It struck me as being a very strange, very unique film (laughs). But every time I watched it, I still remembered the feeling I had after breaking up with my girlfriend so I decided I wanted to make another film about it. That eventually became Hole in the Sky. How did it feel to have your student film shown in Berlin and at other major festivals around the world? It didn't feel real to me. But then, since a very long time ago I've wanted to become a film director. I never considered another occupation, so in some sense it was also natural for me. Kichiku is usually promoted as a violent exploitation horror movie. I think you can say it's a violent film. Of course, the film is not just about the violence, but it's certainly there. If they think promoting it as a violent film will help make people see the film, then I don't mind. But the people who went to see Kichiku purely because it's a violent film, when they see Hole in the Sky they will think that I changed so much in between. It's not true, but I don't really mind. But of course I appreciate that people like you notice the similarities between the films. The title Kichiku refers to "inhumans", but it's a film which is about very human behaviour. So why the title? When I was editing the film and I had all this anger, I suddenly had the idea for this title: Kichiku Dai Enkai. The intonation of it is very powerful, very impressive: DAI! EN! KAI! The thought just came suddenly, it's like a copywriter finding an idea. The sound is good, it's impressive and it stuck in my brain. So after that I decided to make the editing and the form of the film resemble the power of that title. The sound of the word "Kichiku" to an Englishman or Dutchman, I'm sorry to say, comes across as a bit cute. (Laughs) Actually the kanji, the written character, for Kichiku really feels a bit scary to us Japanese. You made a number of shorts before Kichiku. What kinds of films were those? They're like comedies, except that they don't make you laugh (laughs). So I'd rather not show them to people. Maybe I was just too immature and lacking knowledge of the technical aspects, I'm sure that played a part in the end result. Another difficulty was that I really like a very black comedy of a type like Monty Python and the films of Terry Gilliam. I tried to make those kinds of films, but with non-professional actors that's really, really difficult. Kichiku was your graduation project and it's a feature fiction film. Most people would choose to graduate with a short film or maybe a documentary. My teacher in university was Sadao Nakajima, who is quite a famous director. But I didn't respect him and his films are not my kind of films at all. So at first I wanted to make films which were very different from his, just to anger him, to rebel. And also the other students made these very cute love stories and those bored me. So I wanted to make very different, unique kinds of films. Because of Kichiku you have been compared to people like Koji Wakamatsu and Wes Craven, especially their early work. Do you feel any kinship to these people? Somebody told me before that Wes Craven's Last House on the Left is very similar to my film, but I never saw it. Before making Kichiku I had seen a number of Wakamatsu-san's films, but I wasn't especially fascinated by them. I've seen a few more since then. The movies by the Art Theatre Guild, the company that distributed the films of Wakamatsu and Oshima in the sixties, had a very underground feeling. Some of the seventies' American horror movies also had a very underground feeling to them. It's not about any specific director's films, but that kind of underground spirit I like a lot.